I am SOOOOOO ready for Farmer’s Market season. We have all the markets on our calendar in hopes of making it a huge priority this year even though we are doing a CSA. I still love to attend and see what is happening and growing in our community it inspires me and makes me so excited to cook each week. This year we probably will be biking into town from a bike trail entrance to make it easier to find parking for Saturday markets. Saturday morning rides into town sounds so dreamy and like something late spring and summers are made of. As we watch the grasses green now (I know we are a few weeks behind schedule here), we are starting to have access to some amazing things such as Ramps, Morels (soon! ), and Fiddle Head Ferns will pop up in mere days. We also are still enjoying the goods of winter storage. This is a great time to load up on cabbage, make saurkraut, and get lots of potatoes for some base to put with mushrooms and those fresh foraged foods. We are also seeing microgreens and those delicious first Pea Shoots that are pure magic. In the coming weeks so much will become available to us and by the end of the month we will finally and wonderfully see our first big harvest of Rhubarb, chives, and favas. So much excitement leading into June when it comes to what is fresh. 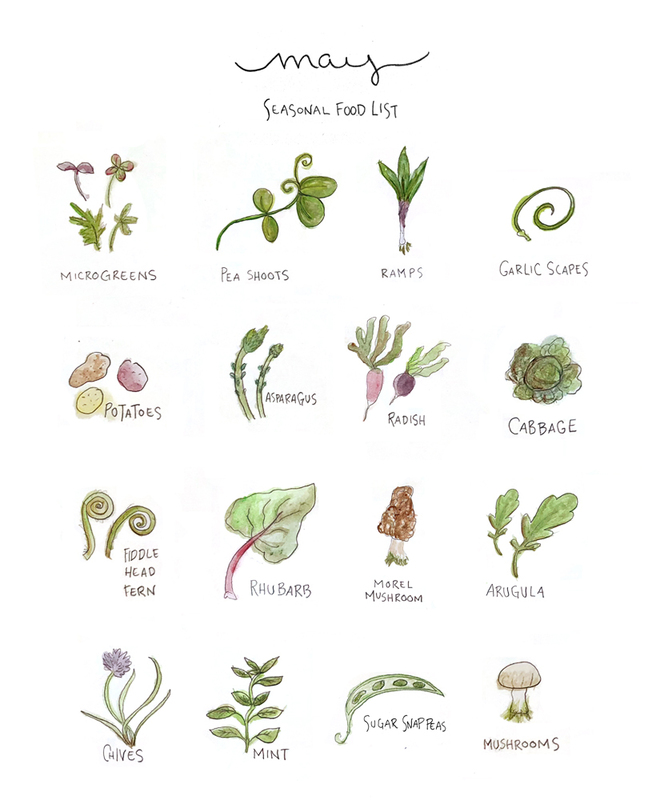 My hope is that by monthly sharing these little doodled lists to it helps you better plan your week of food and look for these wonderful things in the market. I would love for you guys to share some of your favorite recipes for these fresh and in-season recipes below. I am sure lots of you make AMAZING things with these crisp flavors. Finally, if you by chance do not have a chance to either go to the market right now, don’t have a garden, or have access to a CSA you can look for these items in your grocery store. When I was first starting out eating seasonally I focused on only buying what I knew was in season even if EVERYTHING was available in a store. 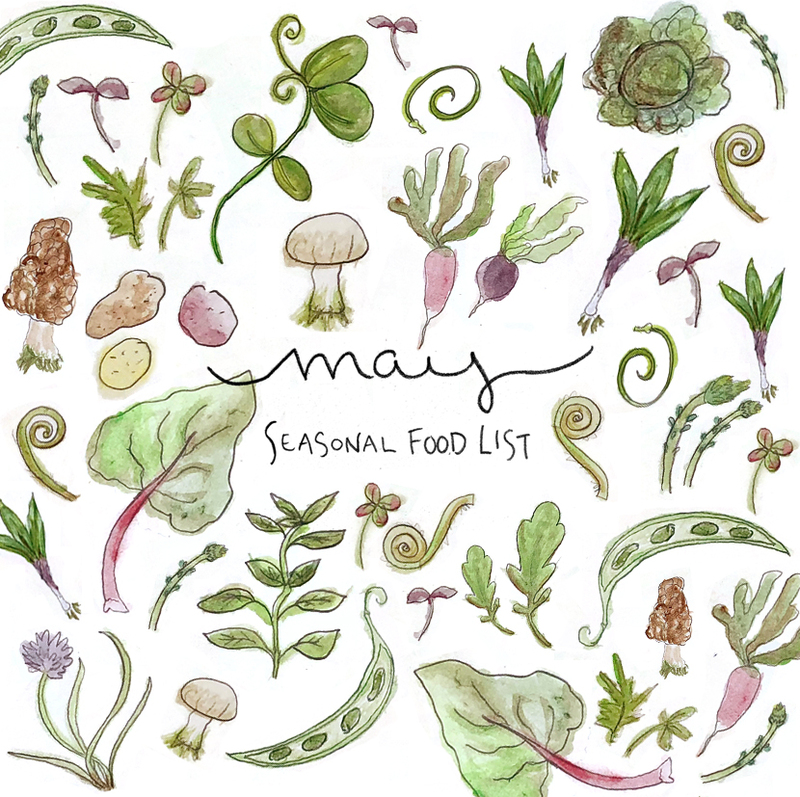 Doing this is helpful to start to find that rhythm of the seasons in your cooking and get used to the practice. Maybe next year you can tackle the garden, but for now this is a great place to start. Below are my notes about these above foods for you to learn a little bit more about these awesome veggies! My favorite topping for EVERYTHING. Microgreens are basically sprouted versions of many of your favorite vegetables. It means that since they are sprouts they contain the same nutrients as their adult verion but it is intensified along with the flavor. They pack a great punch and are pretty. See my post here about them. These are the early stages (similar to a microgreen) of a pea. They are sweet and bright and tender. I enjoy them raw and as a salad or on top of anything I would put microgreens. You can also add them into a pasta right before serving for a beautiful bright green. Have an upcoming post about these next week, but these are typically foraged, but sometimes you can find them in farm markets. When foraging, leave the bulb, and one leaf so they can continue growing so you can come back again. They are basically wild onions so treat them as such. Top them on pizza or my recent favorite, make a pesto! Just replace your basil with Ramps. How about that? These are seen sometimes late May here but most of the time are more prolific in June when they are clipped to encourage the bulb to grow. This is the bud of the garlic flower that will bloom. They taste just like garlic but less potent. Char them on the grill, make pesto, chop them and add to pasta with olive oil and parmesan. Just keep it really simple and even replace garlic cloves with them till fresh garlic comes around again. These are still seen coming out cold storage. These are not fresh from the ground, but they are still available. Usually, farmers are wanting to get them out so they will mark them down significantly. Buy them up clean and chop them and freeze them to add to soups or roast when you would like. I wrote a whole post about Asparagus that I suggest checking out about what to do with them and the different colors. Check that out if you want to read more about Asparagus. Just like potatoes, these cabbages are coming from cold storage at this point. Enjoy it with slaw or buy it up at a good price and make a lot of Sauerkraut. These are the first early sprouts from ferns. Yes, like the ones you see in the woods. They are so bright and fresh. They taste amazing sauteed and added into a pasta or placed on a pizza or just sauteed in butter and eaten with salt and pepper. Usually found by foraging but some markets will have them as well. This is the trickiest guy in the Spring season of veggies/fruits. He is best enjoyed with strawberries so you can either wait and make this or make a rhubarb fast jam or a chutney. Get creative, but know that it is VERY sour. Also always discard the leaves and keep them away from kids and pets they are poisonous. The crown jewel of mushroom hunters is the Morel. Their season is short and quick and we have to keep our eyes open. No one EVER shares where they hunt and it is quite a sacred act up here. Most of the time you will either have to find them yourself (find a friend willing to take you), Look for them at the market, or just maybe a friend will share some after a good hunt. Make sure you properly identify them as there are look-alikes and those are I believe deadly or in the least hallucinogenic. This peppery green is the mildest in its first clipping so look for it early in the season. The later in the season the more clippings makes it less enjoyable. Great farmers will clip and replant if they care about the greens flavor. Eat them in salads, toss them with pasta, add them to almost anything. They are amazing if you get great quality greens. Hands down one of my favorite spring (early summer) herbs. The blooms are the most beautiful thing to top any dish with. Goodness me. This is one of my favorite ways to enjoy them. You can find a recipe where I did this here. There is a reason that Derby Day includes Mint Julep’s, Mint is fresh and abundant especially in that part of the country by then. Use Mint to add to salads or add to cocktails. Be careful with planting though, this stuff will overtake the garden. At the VERY end of the month and the first of June we will see the first harvest of the sugar snaps around the state. We all anxiously await these yummy guys don’t we? I know I do. Grilled, fresh, sauted…any way is great! Pretty every mushroom is wildly available right now in our area. Mushrooms if you enjoy them are amazing in so many ways. From tacos to tossed with grains to topped on flatbreads. The ways are really endless and not to mention locally sourced mushrooms are really beautiful. Know that this is based on the Midwest. Some of these things are exactly in season for us here in Northern Michigan and some won’t be but the idea is that most of these will be available in the coming weeks and to look for these in the market and at the store. Excited to hear your favorite recipes for these veggies. Share them below so other readers can find new ways to cook some of these veggies. Also: Artichokes! I finally overcame being intimidated by them and made them in several ways–they aren’t as difficult as I had feared, but they do take time (except if you just trim and steam them, and dip the petals into butter or vinaigrette–very easy). They’re very nutritious, too. I recently did a how-to. I consider microgreens a winter staple because I grow them on my kitchen counter. Very easy, and I have an almost-constant supply (I have to wait 3 days or so between batches, and a batch takes about 5 days to use up). Plus they look pretty on the counter. I don’t do them in summer because we don’t have A/C and the heat turns the water bad too quickly. French markets aren’t specifically farmers’ markets–there are some local growers, but also vendors of imported foods. I stick to the local growers and know that what I am getting is in season and was grown either organically or with the absolute minimum intervention. Love all of this! I didn’t include Artichokes because we don’t have them growing here in the midwest. I wish we did, but I know they are abundant in California and your area. I love them and they are so good! Megan, i love this. We live in Bayfield and i believe our climates are very similar as well as growing season. I really appreciate how you live seasonally and share with all of us who desire the same. So happy it is going to be helpful!!! I am in Northport for the weekend and so excited to eat locally. Great post! I love these posts – summer CSA is a flexible option down here in NYC and you don’t have to commit all year long. It is a great way to get involved in one. This was super helpful! I like to stay mindful of whats in season.